The Alexa has a T-Strap and secures on the foot with snaps. Fitting is generally your street shoe size. It is available in Silver (S-1) or Gold (S-2) Glitter in American sizes 3-12 X-Narrow, Narrow, Medium or Wide and the heel heights shown below. To order call 810-238-7400 or email us. American Classic (formerly Celebrity) is an American made shoe company. 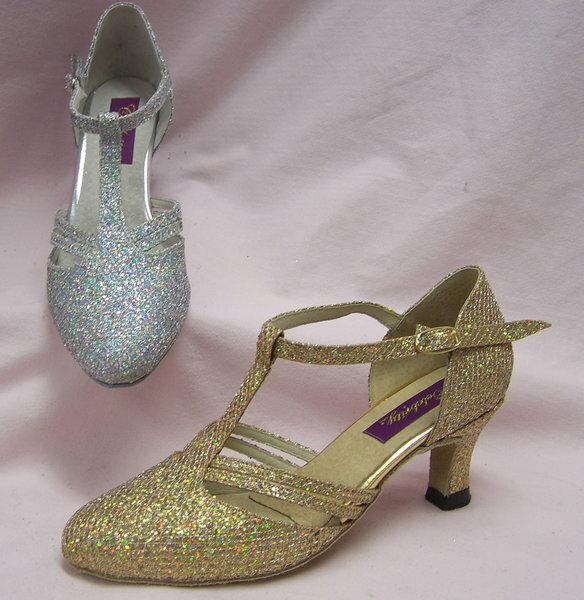 For ladies shoes they offer two types of strap closures (the popular snap closure or the rhinestone quick release buckle). Please note that the closure you see pictured or mentioned will be the closure received upon ordering unless you select a different option under customization. Standard options for ladies’ widths are X-Narrow to Wide, all standard heel heights (see photos) . With so many variables available we have narrowed the options down to what is considered most popular and what we consider “stock” at no additional charge. However to expand upon what we consider as “stock”, custom ordering is available but may require additional fees. Also some customizations to your shoe order will also make them non-returnable. To see customization pricing, go to American Classic Customizations.